"It's all part of the plan"
Netflix spends a lot more than you probably think. And the why and how is critical to understanding its future, competitive positioning and internal conviction. Netflix’s content spend remains one of the most obsessed-upon aspects of the company’s business model and future. It’s also one that’s often misreported or misunderstood. The causes of this confusion have a lot to do with semantics and accounting principles, but the consequences are profound: Netflix is spending a lot more than you probably think. In 2017, for example, Netflix’s content amortization expense was $6.2B. As this figure flows through to the company’s Income Statement (or “Profit & Loss”), it’s the number typically labeled as that year’s “content spend”. That same year, however, Netflix actually paid out $8.9B for content. This latter figure is quantified on the Statement of Cashflows and reflects literally how much Netflix spent on content that year. Conversely, the amortization figure represents only the current (accounting-defined) portion of the costs associated with the content that was available to customers throughout the year. Much of this would include allocations from earlier years (e.g. House of Cards Seasons 1-4), with the rest primarily consisting of only that year’s allocation of that year’s new releases (e.g. House of Cards Season 5). While it might seem pedantic to criticize statements such as “Netflix will spend between $7 billion and $8 billion on content in 2018,” the distinction is critical. To point, Netflix’s 2018 spend is likely to be closer to $12B. Not only is this nearly 50% more than publicized, it means that Netflix will spend more on non-sports content than any of its traditional TV peers (e.g. Disney, Time Warner, NBCUniversal) – even when their many individual networks are consolidated on a corporate basis. 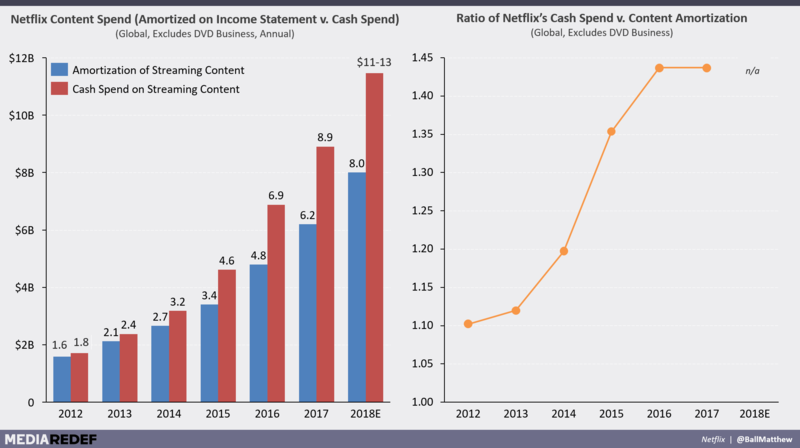 What’s more, the disconnect between Netflix’s cash spend on content and amortization expense has grown substantially over time. In 2012, this ratio was 1.1x (cash spend 10% higher than amortization). In both 2016 and 2017, it was 44%. As a result of this growth, the impact of conflating or confusing the two has also grown. Crucially, this disconnect is most material for the streaming services – and especially for Netflix given the size of the company’s spend and the rate in which this spend is growing. The cash-budget ratio reflects the degree to which a company is planning for and investing in a future that’s bigger than its present. As such, Netflix’s cash content spend (which funds content that will release over the next one to three years) tends to be substantially larger than the P&L content costs they recognize (per accounting principles) in that same year. Furthermore, cash spend is the only effective way to assess how Netflix’s internal conviction or growth expectations are changing. Due to the amount of time it takes to produce new TV/film content and scarcity of unsold TV/film content that has already been produced, Netflix (and others) have only a limited ability to increase a given year’s content budget (i.e. P&L spend) once that year begins (and even then, only a portion this incremental content would be amortized in that year). Similarly, the opportunity cost of abandoning in-progress productions and the time required to economically negotiate the early termination of content licenses means that in-year reductions are typically insignificant. As such, it’s only through cash spend (and its ratio to the content budget) that one can determine whether Netflix (or its competitors) have decided to pour more ‘fuel on the fire’ or damper it, and their expectations for growth. Note, too, that while cash spend is a technical definition, amortization methodologies are not – they are a judgment called made by a company and its independent auditors. In any new industry or business model, the potential for inaccurate amortization schedules exist. As time passes, for example, it becomes easier for any company to estimate the “useful life” of an investment (such as a truck or movie). Netflix is doing the same – but as a result, the company has revised its amortization models several times over the past decade. Given two thirds of Netflix’s costs are in content, the significance of any change is large. Furthermore, many analysts argue the company’s approach remains too generous. And notably, the traditional media companies don’t suffer from these changes or scrutiny; they continue to deploy standard, stable and well understood amortization models/schedules. As a result, and P&L-based comparisons can be misleading. More importantly, content spend at the traditional media companies is relatively flat year-over-year (with this delta further smoothened out by the fact that this spend spans one-to-three fiscal years). This stability means that for them, unlike Netflix, the disconnect between cash spend and amortization is typically modest, if not negligible. At Home Box Office (inclusive of HBO and Cinemax), for example, total content costs have grown from $2.035B in 2015 to $2.260B in 2017 (or +3.3% a year). Netflix cash spend has grown by roughly HBO’s entire content budget in each of the past three years. There are important caveats here. Netflix’s content costs are high in part because it now buys out all the rights (e.g. home video, syndication, EST) for its Originals on a global basis, while traditional networks (e.g. FX or ABC) will typically buy only select content rights and on a single market basis. Furthermore, buying out all rights means that the talent involved in a hit series (e.g. cast, writers, producers) don’t have access to any of the economic upside from participating in a hit series. As such, Netflix must also pay extra (and upfront) to compensate the talent responsible for their Originals for this lost income opportunity (albeit on a risk-adjusted basis). As a result, Netflix’s costs for a given volume of original content is substantially higher than that of linear and/or domestic networks with the same output. That said, this same dynamic means that while most of its traditional networks hedge their content investments, Netflix quadruples down. However, the importance of the cash-budget ratio goes beyond competitive benchmarking and investment forecasting. In fact, bridging the disconnect between the (lower) amortization expense and Netflix’s (seemingly astronomical) actual spend helps answer Netflix’s most important question: just how viable is its economic model? Netflix’s critics and competitors typically focus on the fact that, while profitable on an accounting basis, Netflix keeps spending more cash than it generates from operating its business. The company burned $2B in cash in 2017 (up from $1.7B a year earlier), and expects that figure to grow to $3–4B in 2018. What’s more, Netflix CEO Reed Hastings has promised that negative free cash flow will continue for “many years” and the company continues to accumulate debt (raising annual interest expenses) and content liabilities (increasing the amount it’ll need to pay suppliers over time). However, this cash loss only exists because Netflix is funding next year’s content against this year’s revenue. Netflix could have chosen to stabilize its 2018 content offering at 2017 levels (i.e. not ramp up spending), and its actual cash spent would have been just $6.2B (roughly equivalent to its content amortization) – a “savings” on the books of $2.7B. And had the company done this, it would would have generated $700MM in cash, not lost $2B. The industry and press would do well to focus on Netflix’s cash spend – even when compared to the recognized spend of its traditional peers. Netflix’s amortization figure is a lagging indicator. What’s scary is what’s going out the door: lots and lots of cash. Part 2 of this series explains how (and why) Netflix uses product and technology to economically outspend its competitors. Part 3 explains why Netflix risks so much. Part 4 explains why the term ‘Original Series’ if often a lie – and how Netflix uses this fact to beat its competitors. Part 5 explained why 2019 and 2020 don’t represent significant threats to Netflix despite the volume of new entrants and their impact on Netflix’s library. You can reach Matthew Ball at mb.ball@gmail.com or @ballmatthew.